While prosthetics are becoming increasingly sophisticated, one of the biggest impediments to their potential has been their lack of a sense of touch. A team of scientists may have created a solution that enables artificial limbs to genuinely “feel.” Researchers from Stanford University and Seoul National University have developed an artificial sensory nerve system that mimics the human nerve system. The system is made up of a network of a new type of artificial nerve: one that can sense touch, process information and communicate with other nerves much like those in our own bodies. New artificial nerves could transform prosthetics. The nerve consists of three parts made out of flexible organic components. First, a touch sensor picks up on even the slightest pressure cues. Then, the sensor transmits the input to the second component, a flexible electronic neuron called a ring oscillator, which converts voltage changes into a string of electrical pulses. These pulses are fed into a third device called a synaptic transistor, which sends out electrical pulses in patterns that match those produced by biological neurons. The synaptic transistor can receive and interpret inputs from multiple ring oscillators. The team has used the artificial nerve system to make a cockroach’s leg move. They connected their artificial nerve to a cockroach leg and applied tiny increments of pressure to their touch sensor. The electronic neuron converted the sensor signal into digital signals and relayed them through the synaptic transistor, causing the leg to twitch more or less vigorously as the pressure on the touch sensor increased or decreased. In other experiments, they showed that the artificial nerve was able to differentiate Braille letters and could detect the direction of motion when a cylinder was rolled over it. While the science of artificial nerves is still in its infancy, Bao’s team is encouraged by the progress made so far. The team’s work could help develop artificial skin for prosthetic limbs and restore sensation to amputees—and, perhaps, one day give robots some type of reflex capability. The details of their study are reported in the June 1 issue of Science. 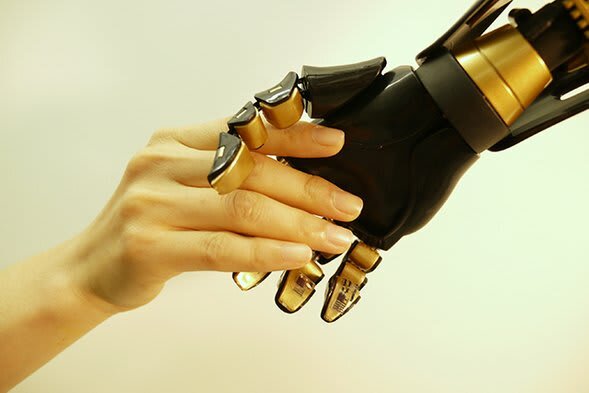 Read more about developments in prosthetics at New Electronic Skin Technology Developed to Change the Face of Prosthetic and Robotic Development.